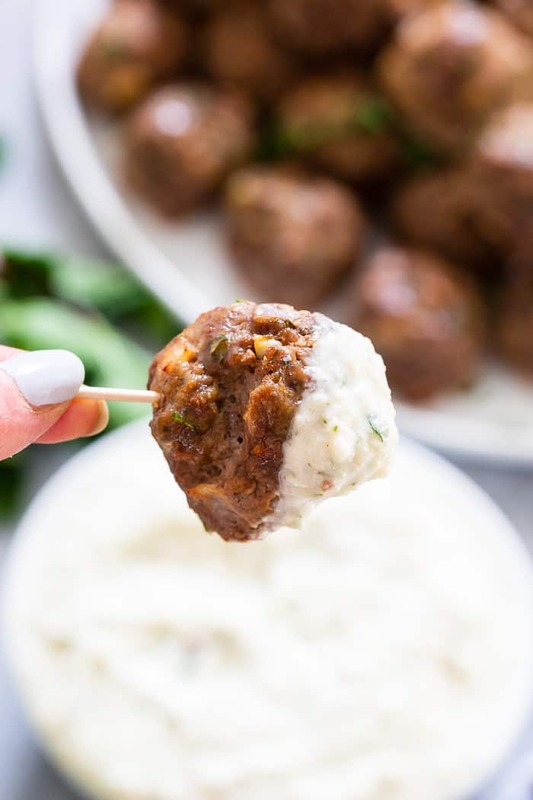 These easy greek meatballs are perfectly flavorful and delicious dipped in a dairy-free paleo Tzatziki sauce! Great as an appetizer or as part of a meal over a greek salad. 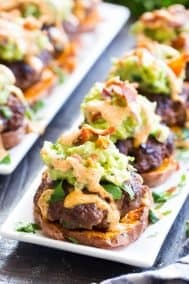 Paleo, Whole30, and keto friendly. Holy meatball we are in for a treat today! I have to admit that I was dang proud of myself for making BAKED meatballs that totally held their own. 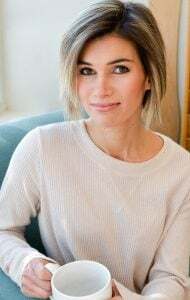 Held their own, as in, the ENTIRE family loved them – not just 1 child but all 3. Big news, big news. Especially for meatballs that have both onions AND green things in them! The horror! 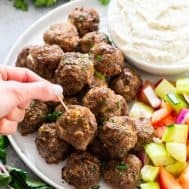 I’m not sure if my kids are just growing up and getting less picky about green things (doubtful), or if the flavor of these greek meatballs is just really THAT good. Latter. Definitely the latter. Here they are in their uncooked glory. Meatballs are one of those funny foods that are just so much more photogenic in their raw state. But let’s get away from that and talk ingredients. 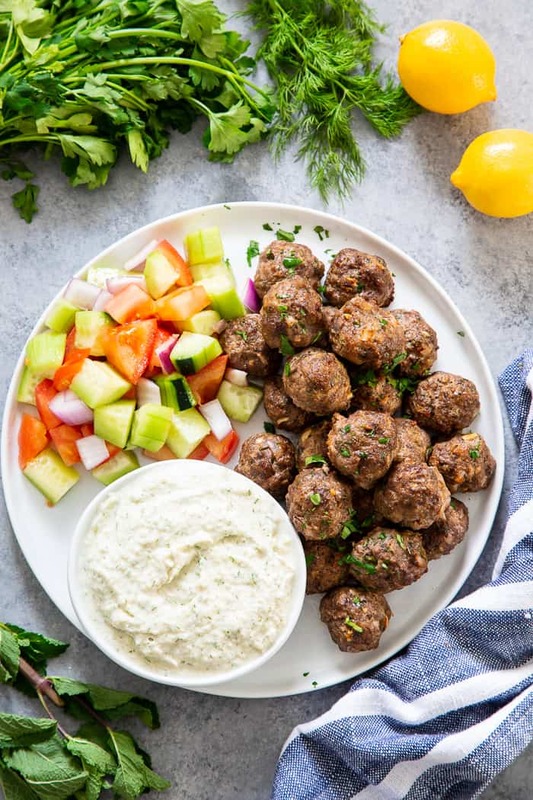 There are two components to this recipe – the greek meatballs and the Tzatziki and many of the spices I used overlap. 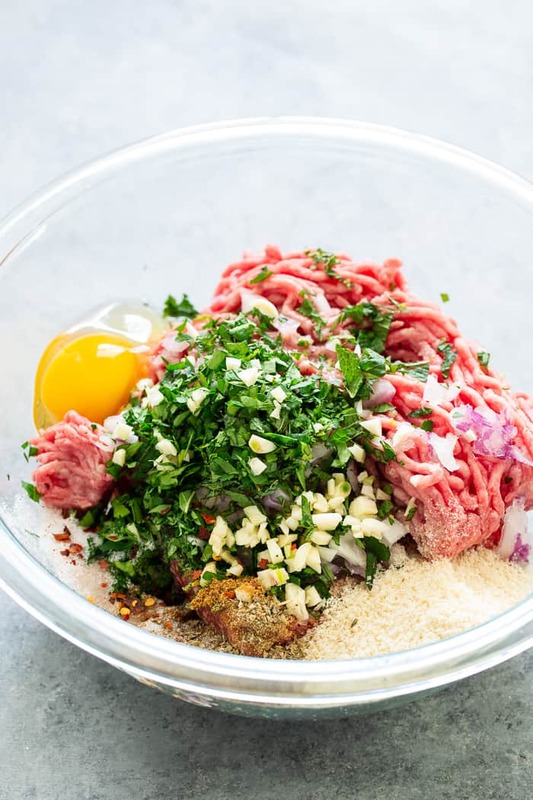 For the meatballs, we start with a combination of ground beef and ground lamb. I think this might be my favorite ground meat combo ever. If you’re more of an all-beef type, feel free to go with what feels right. Then we have fresh herbs + dried spices, a little almond flour and an egg for binding, lemon zest + juice, and onion + garlic. Nothing to argue with there! 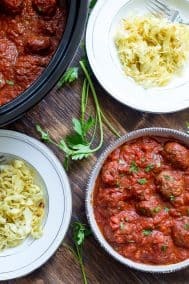 These meatballs are super easy since they’re just rolled, baked, and ready to go! 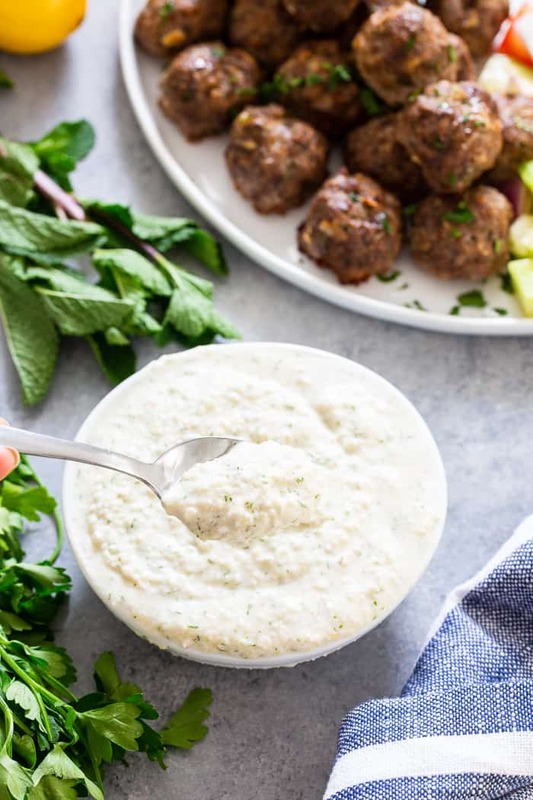 You can either make the tzatziki sauce first and let it chill (so YOU can chill while the meatballs bake!) OR you can whip it up right before serving. Either way, because you’re using coconut cream it should be nice and thick and creamy. The tzatziki is made in a blender or food processor so there’s not much prep happening. I do recommend grating the cucumber beforehand and squeezing water out to prevent the sauce from being overly watery. We also have garlic, dill, salt + pepper, lemon, and a bit of cumin for a super flavorful sauce. 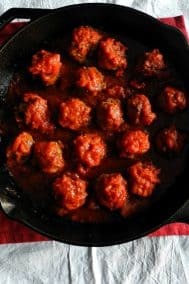 It’s perfect with these meatballs, but it’s also pretty amazing with literally anything else you might want to dip in it. Just saying! 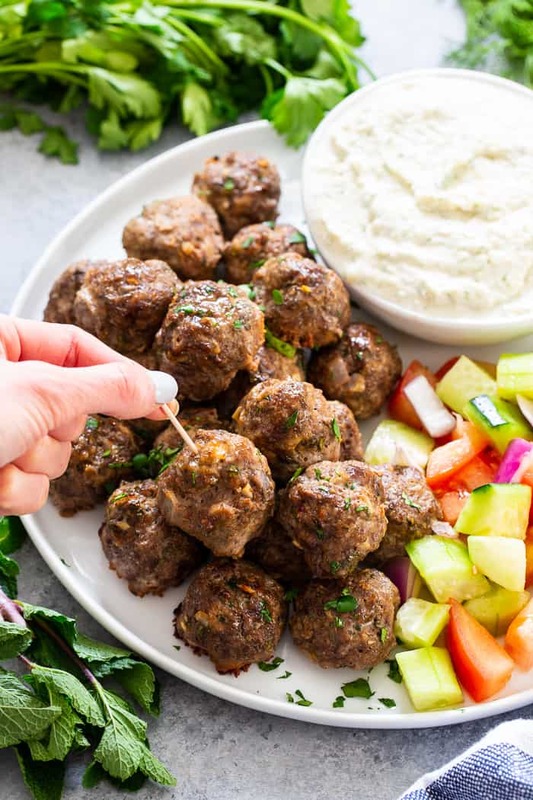 These Paleo Greek Meatballs are really perfect for anything. You can make a full meal of them with some cauli rice and a greek salad, or serve as an appetizer with toothpicks for dipping! You can even put the leftover meatballs in your breakfast hash for something fun and easy. This is what I always do with my leftover meatballs! 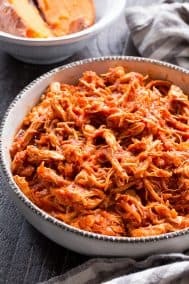 I hope you’re ready for a recipe that’s packed with flavor, FUN, and legitimately easy to throw together. Grab an apron and start grating those cucumbers because it’s time to start – let’s go! Squeeze excess liquid out of the grated cucumber and add to the bowl of a food processor. Discard the liquid part of the coconut milk so you are left with the solid cream, and add that to the processor as well, along with the remaining ingredients. Pulse/process until fully combined - it won’t be completely smooth. 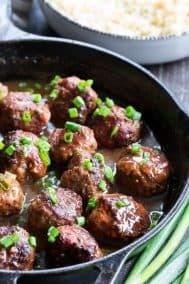 Transfer to a bowl or container and refrigerate while you make the meatballs. 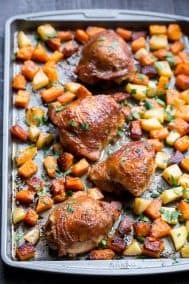 Preheat your oven to 450 degrees F and drizzle olive oil on a large baking sheet. 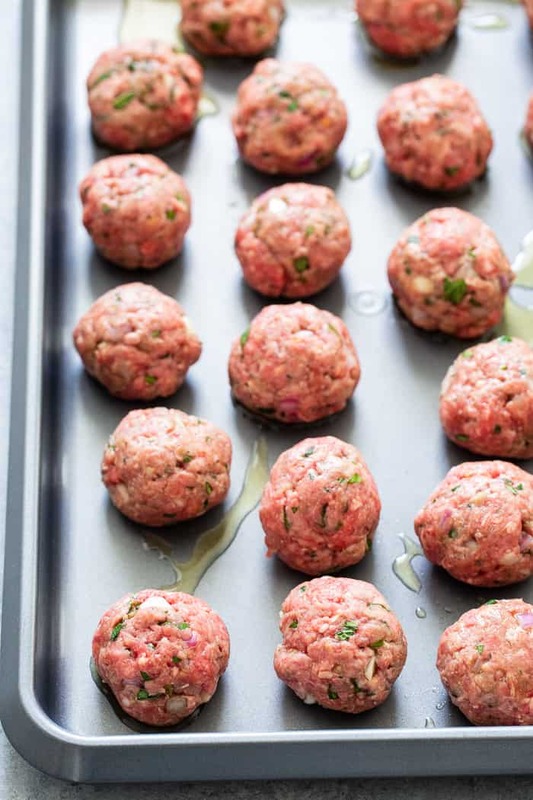 Combine all meatball ingredients (except olive oil) well with your hands until fully combined, careful not to overwork the meat. Form mixture into 24 balls and place an inch apart on the baking sheet. Bake in the preheated oven for 15-17 mins or until browned and cooked through, careful not to over bake. 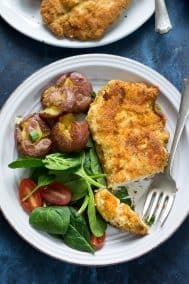 Remove from oven and serve with tzatziki sauce and greek salad. Store leftovers covered in the refrigerator for up to 4 days. Enjoy! 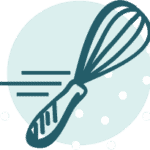 **2 Tbsp tapioca or arrowroot flour can be subbed in for a nut-free version. 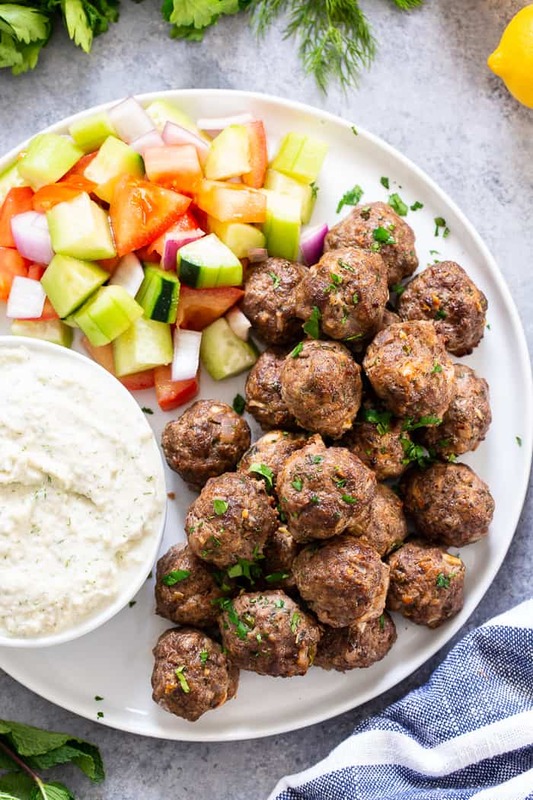 Want More Paleo Meatball Recipes? Try One of These! This looks delicious! I think I’ll make some paleo flatbread and eat this in a wrap. 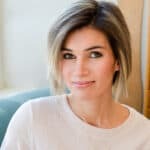 Would it be possible to use coconut cream instead of refrigerated coconut milk? If so, would I use less than 1 can since there isn’t any liquid to get rid of? How many is considered to be a serving? 1 meatball? Going to try these for Super Bowl. Thank you for nutrition info. What is the serving size, 1 or 2 meatballs? 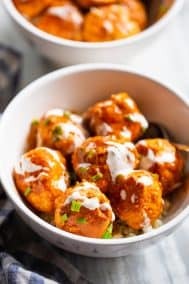 The recipe states it makes 24 meatballs and eight servings, so three meatballs is a serving. Is it one lb beef and 1/2 of lamb and pork or 1/2 lb lamb or pork? Pleasw specify if we are to use cumin as a whole or cumin powder?